Spanish researchers are currently testing a vaccine for rabbits against myxomatosis and haemorrhagic disease virus. 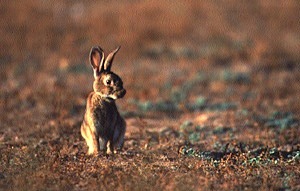 The rabbit, that most Spanish of animals, is a keystone species in Spain, forming an essential part of the food chain, and to a greater or lesser extent the basis of the diet for more than 40 species of mammals, birds and reptiles including the Iberian lynx, which is virtually dependant on it for survival. The arrival of myxomatosis in Spain in 1953 led to the decimation of rabbit populations with mortality rates of 95-100% in many areas, and the extinction of Iberian lynx across almost the whole Peninsula. It also had an unquantified but surely massive effect on other animals. Then, in the 1980s, just when the rabbit began to recover, a second rabbit-control disease, Rabbit haemorrhagic disease virus (vírica hemorrágica in Spanish), was unleashed on the planet. Its arrival in Spain, once again decimated rabbit numbers, and in many areas rabbits have yet to recover despite millions spent by government and hunting estates. Myxomatosis attacks in the summer and haemorrhagic disease virus attacks in the winter. The Instituto Nacional de Investigación y Tecnología Agraria y Alimentaria has been working for more than ten years to find a vaccine against both diseases. Based on this research, the Laboratorio Syva with the support of the Federación de Caza and the Fundación Biodiversidad have now developed a vaccine which with the final field tests still to be done seems to be efficient. It provides an interesting example of hunters and conservationists working together. According to Luis Ignacio Pérez-Ordoyo of the Laboratorio Syva, “The vaccine has been developed from the myxomatosis virus into which is inserted the gene of a protein of vírica hemorrágica, thus obtaining a recombinable virus”. The vaccine is inserted under a rabbit’s skin and then is transmitted to other rabbits by contact. There is no direct transmission to the foetus in pregnant females. Once EU and Spanish medical authorities give the go-ahead, it can be used with wild rabbits. Then, in theory, this harmless virus will spread among the population, so inoculating them. Researchers assure the virus has no negative effect on rabbits or their predators. Tests have been carried on European lynx with no adverse effects. The vaccine has a 100% effectiveness for one year. (Note, I’m unsure as to whether it is then necessary to re-vaccinate or whether the virus will naturally do this). The same researchers also note that it is also necessary to improve the habitat of rabbits in Spain so they can dig burrows and feed, and to repopulate some areas.